One of the goals of the Leavedays application is to register and assess leave in an easy and user-friendly way. 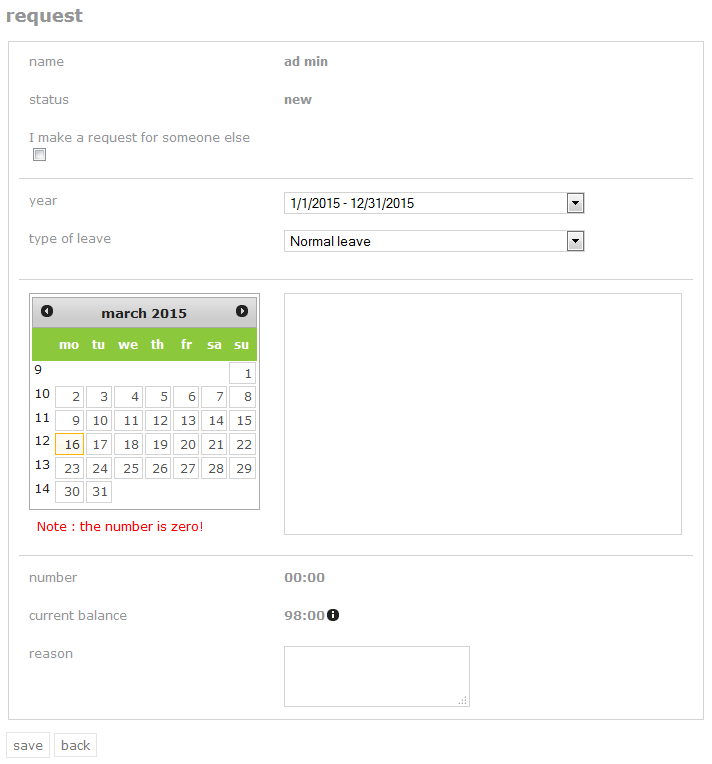 In March 2015, the screen for leave requests has been altered and improved. The changes allow you to submit a request in which you can enter multiple types of leave within one day. In order to submit a request, enter the menu and go to ‘leave’ | ‘request’. 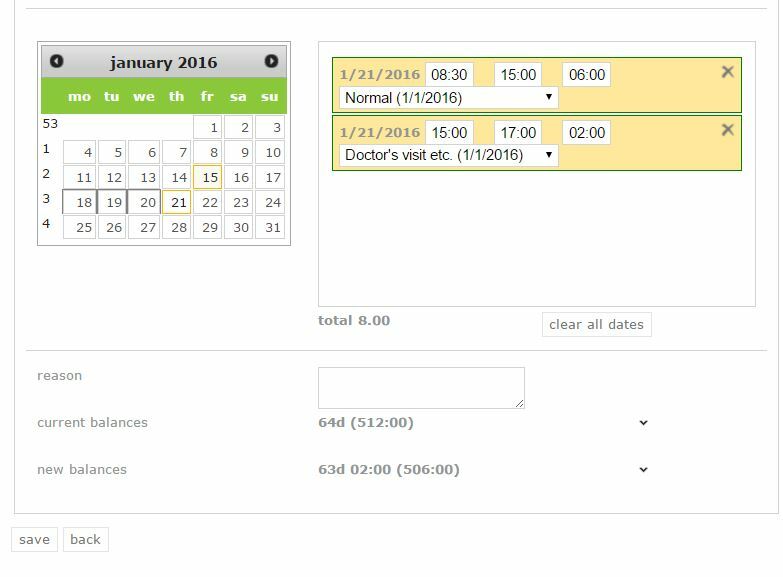 Select the day(s) for which you want to request leave by using the calendar. As soon as you have selected the right day, a block will appear next to the calendar. Select the type of leave you wish to make the request for. If you wish to request leave for the whole day, you don’t need to change anything here. If needed, you can adapt the start or end time of the request. In case you only have the option to request leave for the morning, afternoon, or the whole day, select one of the options given. If you would like to request a full week, you can simply select the week number, and the system will select the entire week bearing in mind the schedule. The number of hours you have requested will be mentioned at number. The current balance for that type of leave is shown at current balances, and the total number of hours remaining after this request will be shown at new balances. When you select ‘save’, the request will be saved and submitted to your manager. You will be notified as soon as your manager has assessed your request. If you want to use multiple types of leave within one specific day, enter the times for the first type of leave first. Then click on the same date again. A new block will appear for the same day, for which you can once again select the type of leave and times. Note! The system will not allow for overlap of these times. 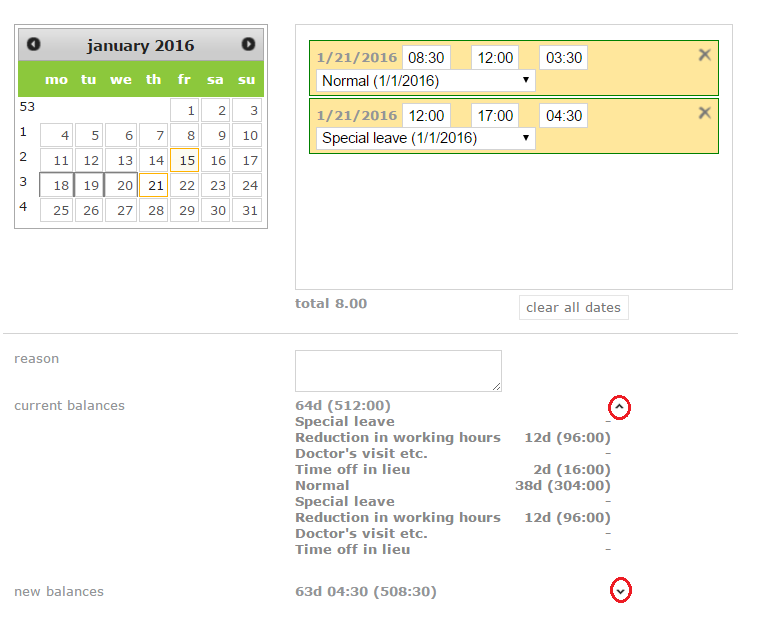 If you want to submit a request for March 5, from 08:30 – 12:00 for “normal leave”, after which you enter a request on March 5th from 11:00 – 14:00 for “special leave”, you can see that one hour overlaps. The system will notify you of this by giving you an error that says “a request has already been found for this day and time”. If there are no overlapping times, you can see the current state of your balance, as well as the balance after the request has been submitted at the bottom. By selecting the little arrows next to the balance you will be able to see a more extensive version of the state of your balance. (see image below). If everything is in order, you can choose to add a remark, before submitting the request by selecting “save”. The manager will now receive a notification that there is a request that needs to be assessed. It is also possible to submit a request for someone else. Read here how you can change or cancel your request.